Times are approximate. Skaters will be notified of their warm up and test times. Monthly board meeting to be held in the media room at Conway Arena. Times are approximate. You will be notified of your warm-up and test times. Please arrive one hour before your scheduled warm-up time. 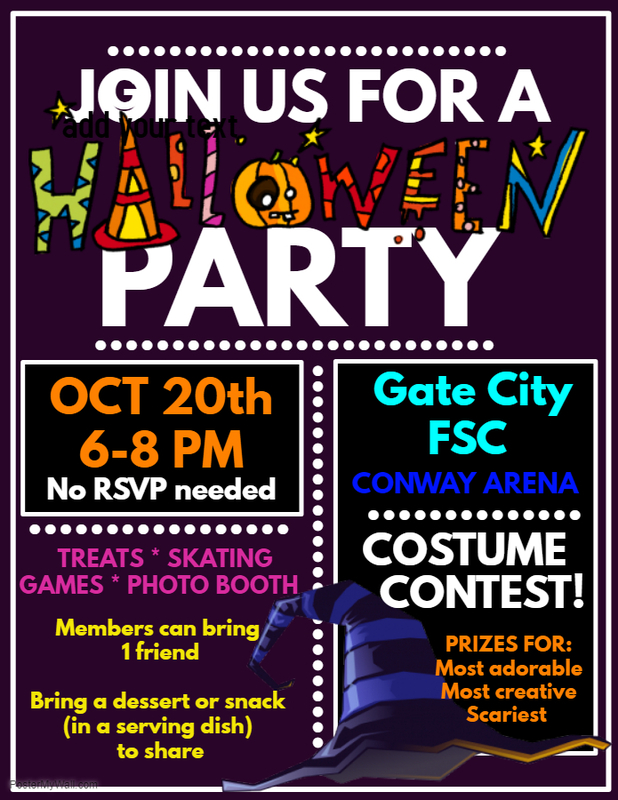 Join us for food, frights and fun at our annual Halloween Party. Join us as we cheer on our competing skaters and get a glimpse of their programs. Exact time is TBD. Held at the Courtyard by Marriott, Nashua. Times approximate. Annual Conway Arena and Gate City FSC Spring Show. Cast party immediately following the show. On-Ice: 7 p.m. - 8 p.m. Games, photo booth, refreshments and more! Prizes for best costumes! Mini-exhibition by our regional competitors; also, meet your skating club board members!